If you’re a San Antonio Spurs fans, brace yourself for some terrible news. A major scandal just rocked this NBA dynasty in a way that’s sure to leave a stain on its legacy for years to come: Spurs head coach Gregg Popovich is going on an indefinite leave from coaching after admitting to taking home a basketball for personal use. Ugh. After such a legendary career, it’s heartbreaking to see Coach Popovich go out on such a shameful note. At a press conference held this morning, Popovich confessed that around eight months ago, he not only took a basketball home from a team practice, but also spent an hour shooting around with it in his driveway without any discernible business purpose for doing so. Although he allegedly brought the basketball back the very next day, making sure it was as clean and inflated as he had found it, the long-tenured coach conceded that it wasn’t enough to make up for the egregious lapse in judgment he displayed when he took the basketball home for his own selfish use. 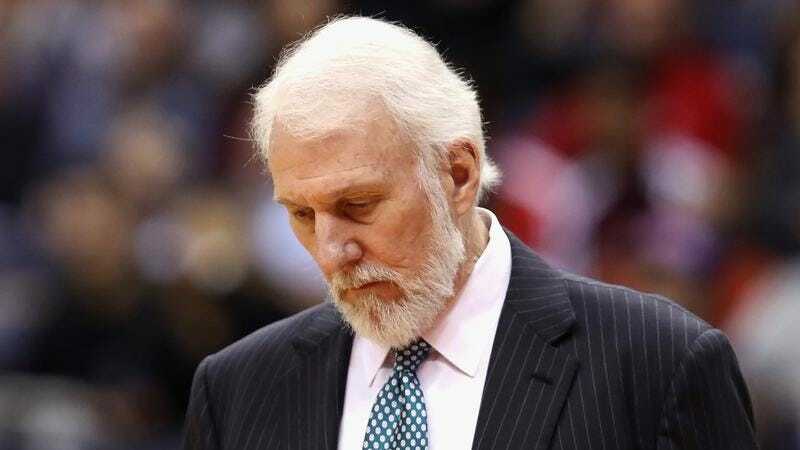 Popovich then tearfully announced his resignation as the Spurs’ head coach, stating that the players will be better off focusing on the game rather than the public embarrassment that his unprofessional conduct might bring to the Spurs franchise. The disgraced head coach then left the press conference with his suit jacket pulled over his head in shame. Absolutely devastating. After five NBA championships and countless incredible triumphs, Popovich has thrown away his entire legacy with one selfish mistake. You can bet that Coach Pop wishes he never even thought about bringing that basketball home to try to dunk with it outside of official league hours, especially now that his wife and family are leaving him in light of this scandalous news. If Popovich ever returns to the NBA, let’s just hope he comes back a more honest man than he left it.